Where am I today? - Somewhere off the east coast of Australia, sipping a cocktail watching the kids play in the water park on the top of the cruise ship. 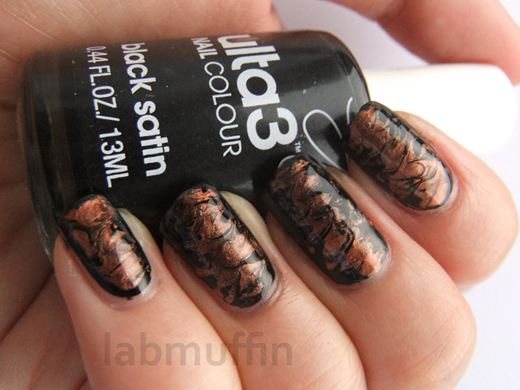 Guest blogger #2 for you tonight is Michelle from Lab Muffin sharing a drag marbling tutorial. I've never tried this technique, so it's great to share something new on my blog. Take it away Michelle. I'm Michelle from Lab Muffin and Polish or Perish, and I'm very excited to be posting a tutorial here that many people have asked me about - drag marbling. If you love the random swirly patterns of water marbles, but don't want to deal with the mess and frustration, you might want to try out one of my favourite techniques, drag marbling. The effect isn't quite as spectacular in my opinion, but to me it's got its own special charm, and it's much less trouble. The specific design I'll be showing today is a tortoiseshell design. 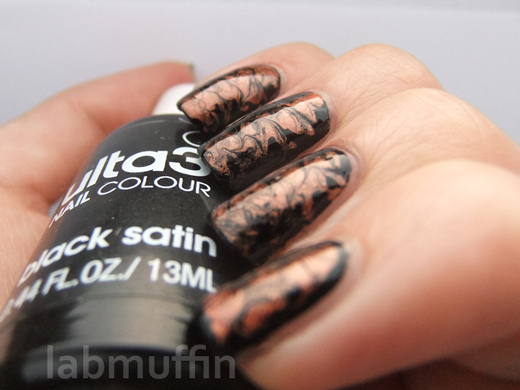 It was the first nail art I ever posted on my blog, and I recently redid it here. Despite having a year more experience, I don't think it turned out much better (although my photography has improved a lot! ), so I'd say it's a pretty foolproof technique! 1. Paint a thick coat of your creme polish. 2. Immediately dab a stripe of your metallic down the middle of your nail. It doesn’t have to be neat, it'll soon be unrecognisable! 3. Grab your toothpick and quickly draw a messy zigzag down the middle of your nail (I've indicated my zigzag in purple). 4. If you worked fast enough, your nail should now look like this! If there are lots of bald patches, you can try working faster, making sure only the point of the toothpick is in the polish, or using slower drying polishes. Clean up the edges and add top coat to finish. ohhhh that is so cool! perfect for autumn too! I need to try this again, love this manicure! I'm looking forward to trying this and with different color combinations too. I need to try this! I don't know why I didn't yet! I'm a big fan of drag marbling because it's so much easier and less messy than water marbling (that, and I'm lazy)! Hope you're enjoying your holiday, Cathy, and thanks for a great guest post, Michelle! 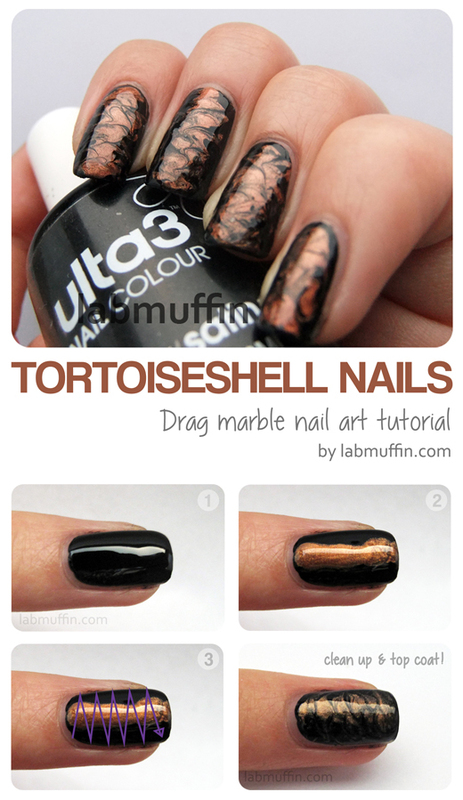 What a nice and easy nail art technique :) And the metallic copper on the black looks stunning. Wow so simple yet stunning! thanks Michelle! These are so simple yet elegant! Will definitely give it a go! Great tutorial, I'm going to try it. Love the colours you've used!